1. CHP is opposed to the institution of martial law and its ramifications in the form of State Security Courts (DGM) and Specially Authorized Courts. Such courts belong to extraordinary periods. They do not deliver justice; they obey orders from those in power. They act as extensions of those holding power. 2. Prosecutors and judges of these Specially Authorized Courts have been carefully hand-picked by the ruling political party so that they would carry out the party’s orders. These courts and their assigned judges have kept their positions as long as they distributed injustice. Those judges who were just and who ruled according to the principle of supremacy of law, and who listened to the voice of their conscience, were removed from the system. They were either assigned to lesser positions or penalized. 3. The judges executing the dictates of the ruling party are also in violation of the Turkish Constitution. They have consistently ignored Article 90 of the Turkish Constitution that stipulates: “In the case of a conflict between international agreements in the area of fundamental rights and freedoms duly put into effect and the domestic laws due to differences in provisions on the same matter, the provisions of international agreements shall prevail.” These judges failed to observe Article 90 of the Constitution in case after case and adopted decisions that are not in compliance with the judgments of the European Court of Human Rights. 5. The litigation has developed according to a process that had been planned step by step. Whatever the prosecutors and judges needed to sentence the accused, the government provided. The Government passed the laws in order to direct the proceedings of the courts. 6. In most of the cases, the judgments were based solely on the statements of the anonymous witnesses. In Ergenekon case 44 unreliable individuals with dubious pasts were introduced as anonymous witnesses. An individual formerly convicted as a terrorist, was the anonymous witness who accused the Chief of General Staff. The accused were prevented from asking questions to the anonymous witnesses. In Ergenekon case, the same person acted as a witness, anonymous witness and accused. Based on his statement which he denied subsequently, the prosecutor linked the shooting at the Administrative Court to the Ergenekon Case and concluded that “the use of force” condition for overthrowing the Government has been fulfilled and asked for imprisonment for life. 7. For the first time ever, in these litigations, a Chief of General Staff was arrested for being a member of a terrorist organization. 8. In these trials, individuals who have never come together in their lives, who have never spoken to each other on the phone, were grouped together as members of a “Terrorist Organization”. 9. For justice to prevail, witnesses need to be heard. Yet, key witnesses called upon by the arrested were not allowed to testify in the court in clear violation of the relevant provision of the Turkish Criminal Procedural Code. 10. The accused were given up to thirty years in prison because of their defense at court; they were barred from attending hearings. 11. In Balyoz case, despite strong indications that the evidence is forged, the court denied the defense requests to a point an independent expert to verify the evidence. The court also refused to recognize the findings of the defence’s experts, whose analysis revealed many anachronisms and inconsistencies rebutting the evidence allegedly obtained from the confiscated computer files. Moreover, the court omitted the assessment of the evidence stage of the trial and thus the defense was denied the opportunity to prove the evidence was fabricated. 12. The defense attorneys’ rebuttals were restricted. They were blatantly harassed during the hearings. 13. As a result of these restrictions, the Istanbul Bar filed a law suit against the Silivri Courts. The response was an attempt to bring down the Executive Board of the Bar. However, on Sunday March 17, 2013 the reply of the General Assembly of the Bar was a slap in the face for the Silivri Courts. 14. During the process of the trials, many detained individuals were left to die. During the proceedings 7 suspects died before they were able to testify. 7 suspects developed cancer. Denied treatment by the courts, Kuddusi Okkır, the alleged treasurer of the so-called Ergenekon organization, died of cancer while in custody. His family could not even find the money to take his body to İstanbul. This was the sad end of the supposed “treasurer of the organization”. A great number of accused, deprived from proper medical assistance may be facing the same predicament. 15. The Turkish Parliament passed a law to prevent the use of “Cliché judgments for continuing arrests”. This law has been totally ignored by the Courts. Judgments with cliché statements continued unabated. Moreover, long period of arrests sometimes more than four years continued without judges examining whether there is a risk of absconding or destroying the evidence. The lawyers objecting long period of arrests, cannot have access to the file due to the secrecy of decisions. The accused therefore can not exercise their right of ”habeas corpus” which is a blatant violation of Article 5 of the European Convention on Human Rights. 16. The fact that 8 elected members of the Parliament are in detention, although it is perfectly possible under the law to release them while they are being tried, is a violation of the right to elect and to get elected. 17. High Court of Appeal convicted Silivri judges to pay indemnity, ruling that they decided continuation of the arrests unlawfully. Yet these judges kept their posts. No respected, honorable judge who is convicted in a case initiated by the accused could continue to judge the same accused without impairing his impartiality. One of the so-called judges reprimanded Mustafa Balbay, an elected member of parliament: “Didn’t you say you were not thinking of becoming a member of parliament? Weren’t you not supposed to go into politics?” The judge was questioning Mr. Balbay’s basic right to stand for elected Office. Moreover, the Government immediately changed the law so that the judges convicted by the High Court of Appeal to pay indemnity were not made to pay these fines. Instead the state would pay their indemnity. Our taxes are used to finance injustice and arbitrariness. Thus, the message was: “Have no fear, the Government is backing you.” It was a manifestation of collaboration between the judiciary and the government. 18. Yet this is not the only example. The AKP Government did the same thing in the Lighthouse Case (Deniz Feneri). In that case, the judges who protected the ones who embezzled the contributions of the faithful were again provided shelter by AKP. 19. 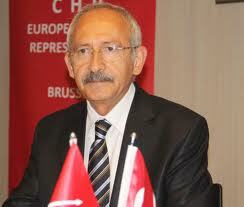 CHP Member of Parliament, Prof. Mehmet Haberal is a devoted democrat and an internationally renowned transplant surgeon. The late Prime Minister Bülent Ecevit had asked Professor Haberal to be their presidential candidate. Haberal declined the proposal saying that he respects the Parliament and that the President should be someone from within the Parliament. Yet these judges, declared Haberal as a coup planner; the prosecutor asked for imprisonment for life. 20. The Ergenekon litigation began with the testimony of a man called Tuncay Güney. Recently Güney made a statement saying the case was a fabrication and that the planned operation had reached its goal. 21. In a TV-interview, Recep Tayyip Erdoğan shed crocodile tears saying he and his party wished for İlker Başbuğ to be released by the court, pending the outcome of the trial. Erdoğan made this remark but did nothing about it. Yet, it was he who, with the speed of lightning, hastily passed a law to protect the Undersecretary of MIT (National Intelligence Agency) when he felt that he too may also get personally entangled in the case. 22. The Court asked the MIT Undersecretariat, Office of the Chief of Staff, General Directorate of Security, and the Gendarmerie General Command if there were a terror organization by the name of Ergenekon. Should the answer be positive, the court demanded the pertinent information and documents from these state organizations. All four replied that they had no record of such an organization. None of the more than 3000 suspects ever mentioned the name Ergenekon. Yet the prosecutor claimed that a terror organization called Ergenekon existed. In the files of this case, there are 120 million Word documents. Which prosecutor, which judge has properly read these 120 million documents to sentence the suspects? It is estimated that a person would need 228 years just to read these documents. It is because of all these reasons that this court is not a court of justice. It has not brought justice, it can not and will not bring justice. We want the judiciary to be independent; we want justice to prevail. A judiciary that is not just, is like dynamite at the foundations of a state. If justice is damaged in a country, the state is damaged. If you eliminate justice, you destroy the state. Without an independent judiciary, there is no protection of individual rights and freedoms.